Taste test: This package contained seven individually wrapped packs of chocolate bars, with 100 calories in per pack. 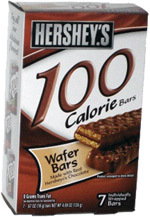 Each pack contained two wafer bars, a wafer-style cookie covered in Hershey's chocolate, similar to those rectangular wafer cookies that are either in vanilla, chocolate or strawberry. In this case, there was a thin layer of chocolate between two wafers, and then the entire bar was also covered in chocolate. The wafer bar itself was very good, and the extra chocolate covering enhanced the taste in addition to keeping the snack compact. The fact that there were two of them in each 100-calorie pack was also sweet, since it didn't make me feel like I had to stick to one bar &mash; you can have the second one without going off your diet too much. Just don't put any extra packs in your lunch sack.